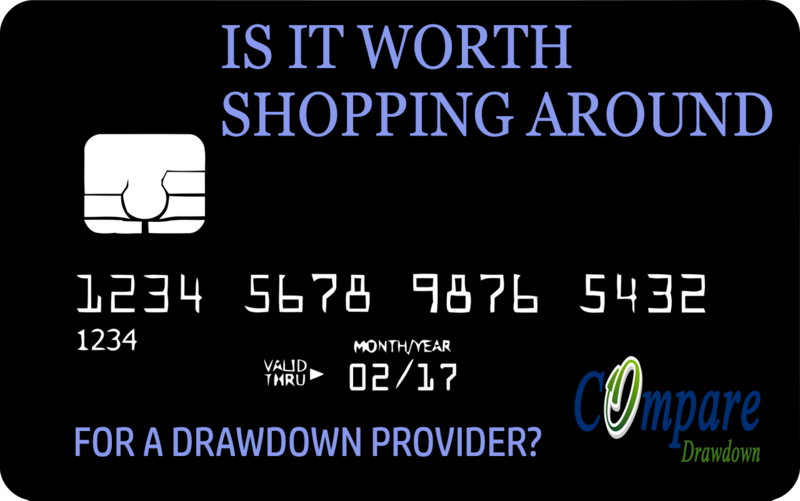 Is shopping around for Drawdown worth it? Is shopping around for Drawdown worth it? Is shopping around for Drawdown worth it? The task of finding a home for your pension at retirement can be quite overwhelming. The myriad of choice is endless, and to those who haven’t invested before, the problem is knowing where to start. But is it worth the hassle shopping around? The easy part is deciding you want to choose drawdown over an annuity, the confusion begins when you start trying to work out where to put your funds. 36% of those at-retirement stay with their existing provider. Others are forced to move their pension because their existing providers don’t offer a drawdown facility. Once you have a list of ‘wants’ from your drawdown provider, you now need to start trawling through their websites. A common theme I hear, is that it’s very difficult to get a quote/illustration. Many of the larger providers provide an in-house sales team or adviser. They can be useful to talk you though their offering and potentially give you regulated advice on the best product from their range. They should also be able to provide you with a quote/illustration after a chat. But how do you know how this compares to the rest of the market offerings? The long answer is you speak to them all, and ask each one to send you an illustration detailing their solution. If your top priority is keeping ongoing costs down, you need to study the illustrations and see how much, per annum, the costs of the service equates to. Each provider has a different fee structure and some are more favourable to certain fund sizes. Is this a useful exercise though? How much difference could there be between providers? Lets choose a portfolio of 4 funds from the best performing funds in the last 5 years according to trustnet. The difference in the ongoing costs to run this portfolio, range from 0.9% to 1.8% according to Selectapension (adviser research software). To be clear, this portfolio will perform exactly the same in each of the 56 providers who offer it, but your net outcome will be drastically different. 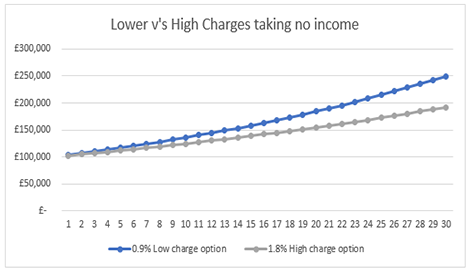 Lets take the lowest and highest cost options at 0.9% & 1.8% respectively. Lets presume you’ve take your tax-free cash and are investing £100,000 in drawdown. Lets also say you wish to withdraw £5,000 a year and the investment portfolio grows at 4% before charges. As you can see from the graph below, the effect is huge. 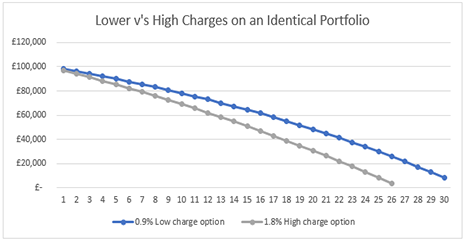 The higher cost option runs out after 26 years, at which point the lower cost option has £25,734 still in the portfolio. If tax-free cash was taken at the outset but the fund left alone for 30 years, the difference is even bigger. At the end of a 30 year period, the lower charge option is £249,896 versus the higher charge option which is just £192,099. That’s a whopping £57,797 difference in growth which you could be giving away by not choosing the right provider. Next lets look at the choice of funds. Many of the larger pension providers who offer drawdown and expect those to roll over into their own proposition only offer in-house funds. They do offer a good level of diversification globally and across asset classes but they can be restrictive by only offering their own funds. What if there are better performing funds you don’t have access to? If we look at the UK All companies sector we have 256 funds being offered by various fund managers. The difference in the 2016 performance ranges from 51.5% to -6.4%. So based on £100,000 invested you’ll either be banking £151,500 or have reduced your fund to £94,600. That is in one year alone. It’s therefore worth asking your pension drawdown provider, how many funds they offer and do they allow investments to be held outside of the company funds. Check out the top performing funds in each sector. The beauty with most providers is that they allow flexibility to change funds without additional charges (some limit fund switch per year). Could you be missing out on some of the top performing funds? It’s also worth considering how your funds are managed. If you’re picking the funds yourself, you’ll be responsible for the fund changes and keeping a tab on how they are performing against their peers. As a result of pension freedoms, many providers have ‘suggested portfolios’ based on risk levels of cautious, balanced or adventurous. One thing to note though, is that they may have model portfolios you can invest straight into at the outset, but they won’t make a recommendation of fund swaps in the future. This would constitute as regulated advice, and unless you have chosen to pay for ongoing financial advice, these portfolios will stay static unless you personally make changes. If you choose to use a financial adviser, the management of your portfolio will be a lot more closely monitored. Either the adviser will suggest and make changes or the portfolio you have been recommended will have a facility for this to be done automatically by the portfolio manager(s). Well, the economic landscape is always changing. It’s very rare to find fund managers who consistently out perform their peer, with some exceptions. Certainly asset classes fall in and out of fashion as can be seen by the widely reworked ‘patchwork quilt’, as data from fund managers MFS shows. Note very little consistency of a top performing asset class. What performs well one year can be and underperformer the next. The key is therefore diversification and a well-planned or managed portfolio. Having a fluid fund that can make changes to strategy and change fund managers is therefore going to be more advantageous that a static fund. The thing is, it’s very difficult to know how your portfolio of fund have performed against the rest of the market once you’re in it. If you have positive growth, who cares you say. Well if your fund has gone up by 6% but the market average is 15%, that’s a lot of growth to be giving up. There are certain years, such as 2016, when the vast majority of UK funds had a positive return, the question is did you miss out on better returns. Picking a drawdown provider comes with many considerations, we’ve discuss a few but there are many more. In answering the question “Is shopping around worth it”, well based on the evidence yes, it make thousands of pounds of difference to your portfolio. If you’d like us to help you shop around for a pension drawdown provider and find the best solution for your situation, please complete the form below and we’ll be in touch for a chat.